Let’s say you’re writing an article about a plant, or your local flora, or a pioneering botanist. 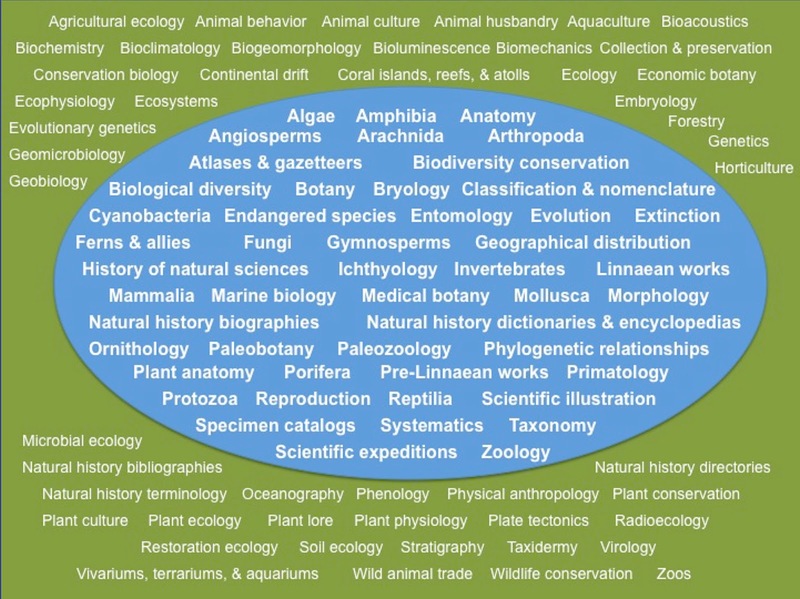 Now … close your eyes and imagine you’re in a huge library dedicated exclusively to biodiversity, with 200,000+ holdings (many rare) scattered across the globe. Next, imagine giving the name of your plant or botanist to a “librarian” who then piles all relevant books, articles, field notes, correspondence, etc., on your desk almost instantaneously! In fact, this library is not imaginary. It’s quite real, though in a virtual kind of way. 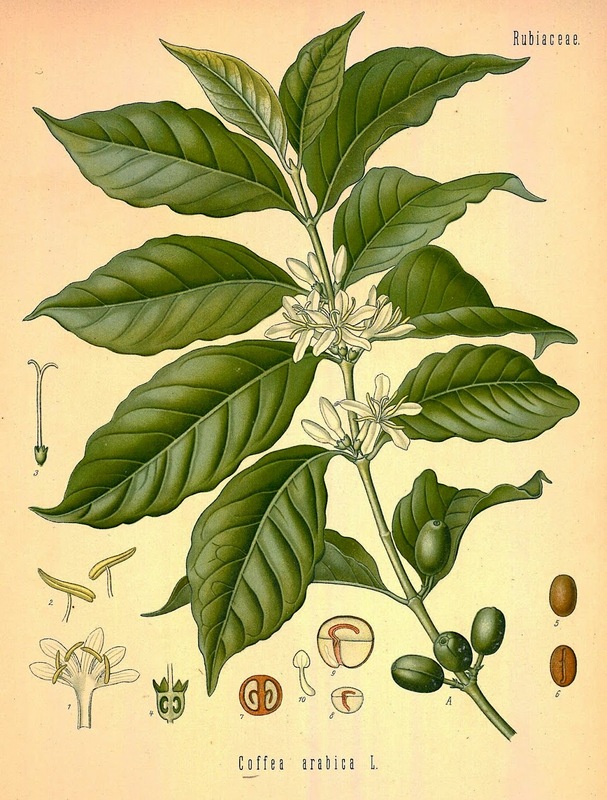 It’s the Biodiversity Heritage Library—headquartered at the Smithsonian Institution in Washington DC, but easily accessible from your office, home, or favorite coffee house. I discovered the BHL in 2014, while putting together a post about the history of the lanceleaf cottonwood (Populus acuminata). BHL soon became my go-to site for information about botanical exploration of the American West. What I like most is the quick easy access to lots of useful information. Documents that were difficult to access or even unavailable only a few years ago are now just a search and a click away. 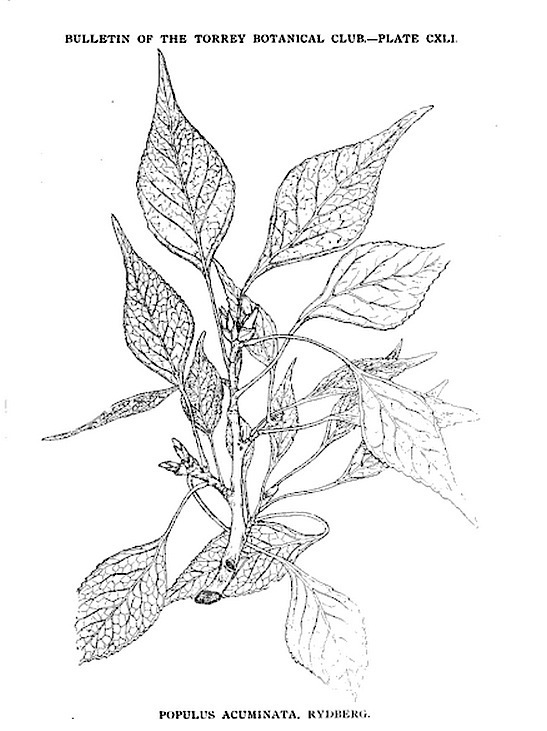 Per Axel Rydberg’s Populus acuminata. From American Black Cottonwoods, 1893; BHL. Edwin James’s Jamesia. 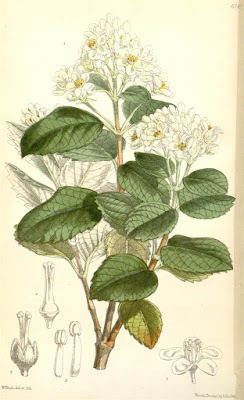 From Curtis’s Botanical Magazine, 1875; BHL. 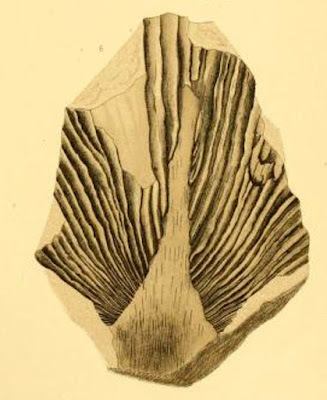 Fossilized palm frond (Powell palmetto perhaps?) collected near Rock Springs, Wyoming. From JS Newberry’s The later extinct floras of North America, 1898; BHL. Put another way, BHL is making biodiversity literature “freely accessible to a global audience … thereby liberating taxonomic names and bibliographic data associated with the content for creative re-use.” Among the plant names most recently liberated were those in our very own Castilleja, the newsletter of the Wyoming Native Plant Society. 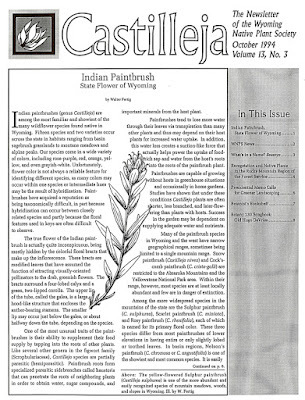 In October 1994, the Wyoming Native Plant Society newsletter was given a name: Castilleja. It all started last October when the BHL blog featured a post titled A Local Focus: The Native Plant Societies of the US. 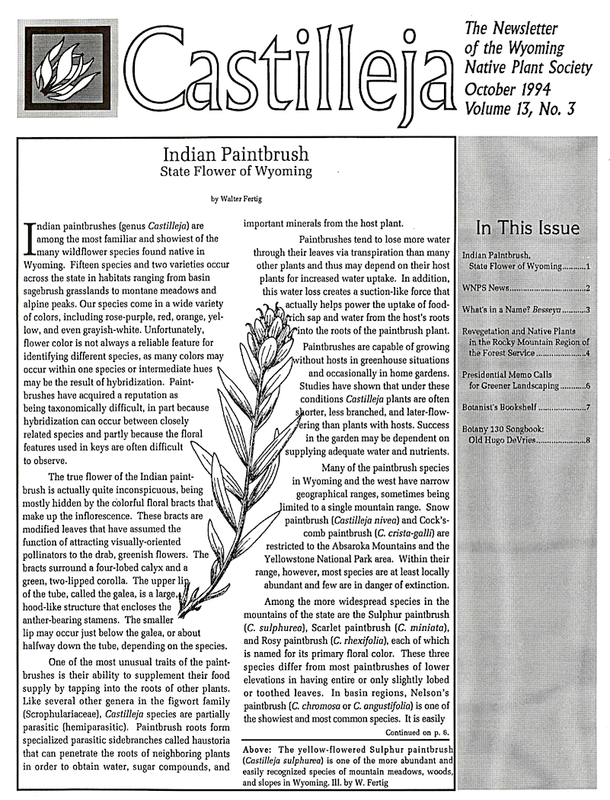 When I read that native plant society newsletters were being added to the collection, I contacted Project Investigator Susan Fraser at The New York Botanical Garden, asking if Castilleja were part of the plan. Indeed it was. “We would be thrilled to include Castilleja in the project,” she replied. Incorporating native plant society newsletters into the BHL is part of Expanding Access to Biodiversity Literature—a two-year project designed to “preserve and provide access to small natural history and botanical collections and publications.” It’s conducted by the New York Botanical Garden in partnership with Harvard University, the Missouri Botanical Garden, and the Smithsonian Institution Libraries. Before Castilleja issues could be processed, a permissions form had to be signed (the society President took care of this). Fortunately, PDFs were available for all issues; these were transmitted en masse to BHL. Then the techies worked their magic. Now, whenever someone searches BHL for Boechera pusilla or Yermo xanthocephalus, for example, relevant issues of Castilleja appear on the results list. We’ve hit the big time! The image below shows one result from a BHL search for “yermo xanthocephalus”—the desert yellowhead, endemic to Wyoming. As I scrolled through Castilleja Volume 17 Number 4 (1998), scientific names on each page appeared in the box on the lower left. Note that contents can be printed or downloaded (either the entire work or selected pages). I’ve used the latter option many times. Usually the pages arrive well within the hour, whether from the newsletter of a neighboring native plant society, or from a rare old book in a library thousands of miles away. How did BHL manage to find yermo among the 51,749,439 pages held in the collection? It was magic!!! No, not really … sorry. But it’s just as cool as magic. 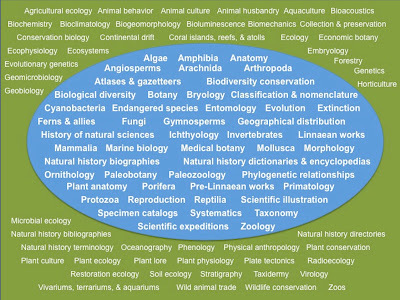 As texts are processed, scientific names are extracted from each page using Global Names Recognition and Discovery (GNRD), a taxonomic name recognition algorithm. GNRD provides an open and global-names-based infrastructure to index, organize and manage biodiversity data. Like BHL, GNRD aims for easy public access, with the goal of spurring widespread and innovative use of biodiversity data. A noble goal indeed! 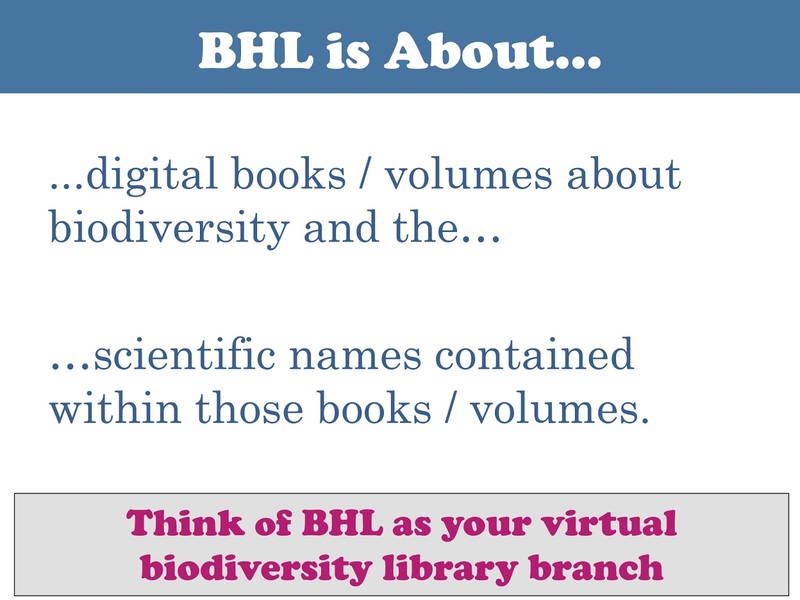 So if you’re in need of biodiversity literature, especially if it’s old or rare or otherwise difficult to access, pay a visit to the BHL. Adventure and discovery start here. And if you’re looking for a good time, browse the always-interesting BHL blog (warning: you'd better have plenty of time on your hands). Above, Coffea arabica was the first coffee species to be cultivated, and still accounts for most of world's coffee production (from Köhler's Medizinal-Pflanzen; see The Berry that Changed the World). Below, Miss C.H. 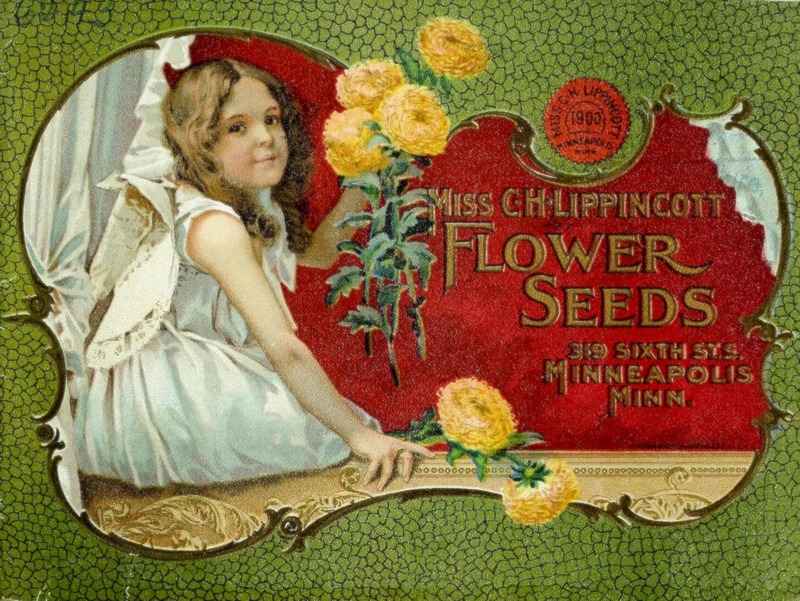 Lippincott Flower Seeds catalog cover (1900), from Leading Ladies in the World of Seeds (you can view over 11,000 seed and nursery catalogs in the BHL collection!). Good to know! Thanks! I didn't know it was free and easy to access. What a wonderful post! I'm writing to let you know that yesterday, 4/11/17, Castillyea was added to the Digital Public Library of America or DPLA. 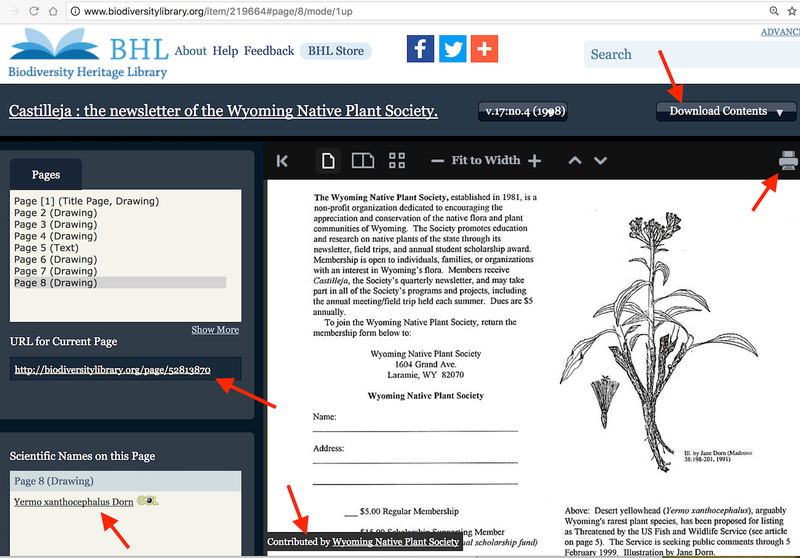 See https://dp.la/search?utf8=%E2%9C%93&q=wyoming+native+plant+society. 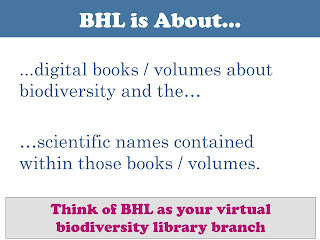 This happened when BHL was harvested by DPLA. Hi Hollis - I was involved in uploading many of the Castilleja issues and its wonderful to hear the positive feedback and impact on the community! What an amazing project - and so HUGE! I have immediately bookmarked your link to the blog, and to the resource.